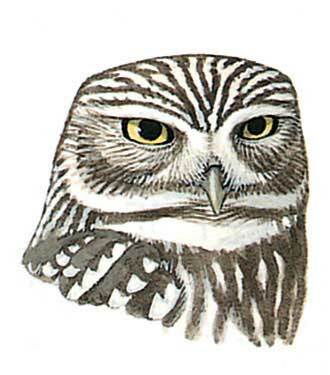 Small owl with round, flat-crowned head and long legs; often sits in the open in daytime on buildings or telegraph-poles. Distinctly white-spotted crown and nape and white-blotched upperparts and wings; boldly streaked underparts; eyes yellow, framed white. Flight deeply undulating (alternating rapid flapping with closing of wings) unlike straighter flight of the scops owls. If agitated, often bobs in an upright posture. The pale form 'lilith' is soft sandy to warm brown with more distinctive white spots on head and upperparts and less streaked underparts than darker forms in the region.